2011, Warner Bros. Pictures. Directed by Martin Campbell. Running time: 105 minutes. PG13. Starring: Ryan Reynolds, Blake Lively, Peter Sarsgaard. WARNING! The last bits of this review contains some stuff that might be considered spoilers-although a lot of it's in the trailer and it's kind of vague if you haven't already seen the movie. 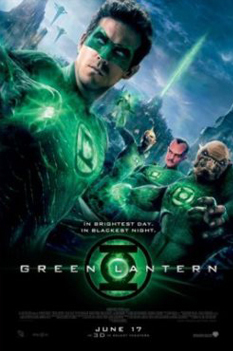 Helm: There is no intergalactic squadron of Green Lanterns that protects the universe from evil. That is the job of the Warriors of Valhalla, the Valhalldarim, Valhalladin and Valhalladyr. Mathew: It's fiction, Helm. FICTION. Helm: I did not care for it. Bah. Mathew: Okay. Put your hurt feelings aside for a moment. No one was trying to slight you or any fellow magic hats that protect the world from destruction. Helm: I am the only Helm! The others are Blade and Shield! Cretin! Mathew: Holy crap, Helm! I hate when you do that. That's like the psychic equivalent of total body rug burn! Helm: Thou didst annoy me. Mathew: Don't get all thee and thou with me. I didn't make the movie. God that hurts! Helm: Don't be a baby. And I cannot believe you dragged me to see Green Lantern. Mathew: Come on. It wasn't that bad. There was some cool action and nice effects and Blake Lively wasn't too bad to look at. Helm: The logic and plot were as full of holes as your feeble brain. In places, there were more holes than plot. Mathew: Granted. But it was still fun! And Ryan Reynolds and Peter Sarsgaard were really good in it. Helm: If all you want from a film is an excuse to vegetate for 105 minutes while shoveling popcorn down your gullet and chasing it with gallons of sugar water, then perhaps it was a good movie. For 150 million dollars, however, I want more. I want believable characters who make smart, or even just explicable, choices. I want a logical progression of plot points. My soul cries out for decent pacing and a stimulating mix of action and pathos. Green Lantern delivered on none of these expectations. Mathew: Dude. You're starting to scare me. What are you, a real film critic now? Why can't you just sit back and let a movie wash over you? Helm: I don't know, let me think on it. Hmmmm. Why was Abin Sur, supposedly the greatest of the Green Lanterns and the mightiest warrior in the universe, so quickly and easily dispatched by Parallax? Why, if Green Lantern rings infallibly pick only fearless people, was Hal Jordan chosen? Why, if all other Green Lanterns are fearless, were they so easily conquered by fear? Why, if the Green Energy of willpower is the mightiest force in the universe, did the Immortal Guardians dabble with Yellow Energy in the first place? Why, if Yellow Energy was so uncontrollably dangerous and created such disastrous effects the first time, did they dabble with it a second time? Why, if the Green Energy of willpower can manifest whatever a ring wearer can imagine, were all Green Lanterns not completely and utterly unstoppable upon donning their rings? Why, if this was an action film, were there so few decent fight scenes or even fight scenes that actually came to a real conclusion? And why, oh why, did Hector Hammond have to use his telekinetic abilities to fling a beer tap into the rotors of the helicopter when he could have used his telekinetic powers to break the rotors themselves? Or simply crush the helicopter outright? Mathew: Whoa. Okay. Good questions. But you're over-thinking this. I think your problem is that you can't eat popcorn. I enjoyed the movie for what it was. Helm: And I hated it for what it might have been. Helm: That is why I often hate you, Mathew. Mathew: Ouch. And yet, the gods chose me. Ha!